This Strawberry-Watermelon Shortcake is a twist on a traditional strawberry shortcake – made with sweet cake or biscuits – but adds our favourite ingredient – watermelon! Easily save time on this recipe by using store-bought biscuits or whip cream, or both! In a food processor, combine 1 cup of the watermelon cubes and sugar. Pulse until smooth and transfer to a large bowl. 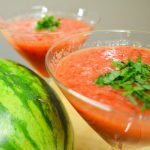 Add the quartered strawberries and remaining 1 cup cubed watermelon, toss to combine. Cover with plastic wrap and let sit for 30 minutes and up to 2 hours. Meanwhile, make the biscuits. Preheat the oven to 425°F (220°C) and line a baking sheet with parchment paper. Set aside. In a large bowl, whisk flour, baking powder, salt, and 1 tablespoon (15 mL) of the sugar together. Using a circular biscuit cutter or pairing knife cut out 3 or 4 rounds in 3-4 inch (7.5 – 10 cm) circles and place them on your prepared baking sheet. Bring the scraps together and pat out to make more biscuits. Repeat until all the dough is used. You should end up with 6 biscuits. Brush the tops of the biscuits with the remaining heavy cream and sprinkle with 2 teaspoons (10 mL) sugar. Bake the biscuits for 15 minutes or until golden brown on top. While the biscuits bake, make the whipped cream. In the bowl of an electric mixer, combine the whipping cream and vanilla. Beat at medium high speed until soft peaks form, then, with the mixer running, slowly add the sugar until the soft peaks become slightly firmer. To assemble the shortcakes, cut the biscuits in half. 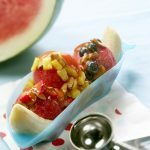 Place the bottom half on a plate and top it with whipped cream, followed by a spoonful of the strawberry-watermelon mixture. 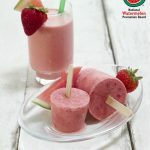 Cover with the top half of the biscuit and top with one last scoop of cream and strawberry- watermelon mixture. Serve immediately.